Orlando, FL – Celebrate Easter Sunday with a delectable brunch buffet in Reunion Resort’s Grande Ballroom April 5, 2014. 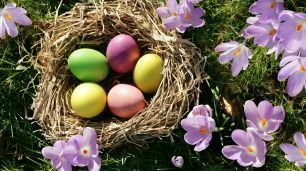 The spring-fresh brunch will have seatings at 10:30 a.m. and 1 p.m. and includes children’s activities and an appearance from the Easter Bunny himself. For more information, visit www.reunionresort.com. The Easter Sunday celebration will feature a chef-attended omelet station, carving station with maple glazed ham and Dijon herb-roasted strip loin, a spotlight station with seafood chowder, spice-rubbed mahi-mahi, roasted chicken and more. The buffet also features a variety of roasted spring vegetables, desserts including mini cupcakes and cheesecakes, and much more. The cost is $47.95 for adults and $21.95 for children (4-12 years of age). Reservations are required by calling (407) 396-3184. Reunion Resort is located at 7593 Gathering Drive, Kissimmee, FL 34747. For more information, visit online at www.reunionresort.com or call (407) 662-1000. Operated by Salamander Hotels & Resorts, the AAA Four Diamond-rated Reunion Resort located in Orlando offers premier multi-bedroom villas, highlighted by the 96-suite main hotel with a stunning lobby; and luxury private homes, each with lavish appointments and exquisite decor. Reunion Resort features 360 resort accommodations including luxury condominiums, private villas and vacation homes surrounded by 2,300 acres of lush landscape and nature preserve, elegantly appointed meeting space, a full-service boutique spa, multiple pools, slides, water playgrounds and a 1,000-foot lazy river. Part of the Grand Golf Resorts of Florida portfolio, Reunion Resort is the only location in the United States with golf courses designed by the golf greats Jack Nicklaus, Arnold Palmer and Tom Watson and also features the exclusive ANNIKA Academy by Annika Sörenstam. For additional information call 407-662-1000 or visit www.reunionresort.com.